We are Producers and Suppliers of Farm Fresh Frozen Vegetable. Our experts make use of advance technology of cold storage, along with modern techniques of germ- Free packaging for providing this frozen vegetable. Also, we pack this frozen vegetable using hygiene packaging material and offer at very nominal price. Offered frozen vegetable is valued in the market for its freshness. We are Producers and Suppliers of Farm FreshFrozen Vegetable. Our experts make use of advance technology of cold storage, along with modern techniques of germ- Free packaging for providing this frozen vegetable. Also, we pack this frozen vegetable using hygiene packaging material and offer at very nominal price. 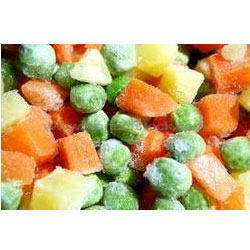 Offered frozen vegetable is valued in the market for its freshness.